The choir is open to all generations, and any middle and high school students who want to supplement their school singing experience with additional singing in the church choir are especially welcome. Rehearsals are Thursday nights 7:30pm- 9:30pm in the UUCSS sanctuary. For more information contact our Music Director, Michael Holmes, at musicdirector@uucss.org. 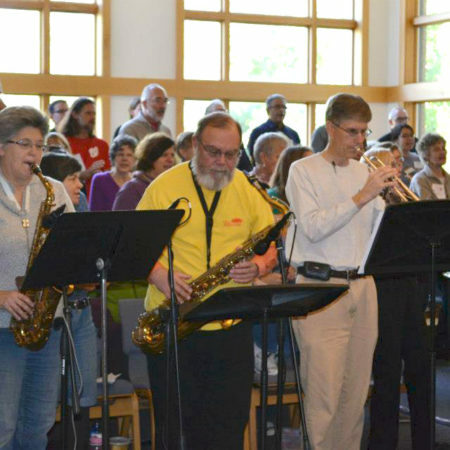 The Sanctuary Singers (Choir) perform a diverse array of styles of music, including contemporary UU, classical, gospel, chant, jazz, and early music, normally two Sundays per month during the regular church year, with the summers off. The choir can be heard a cappella, in collaboration with staff accompanist Phyllis Stanley, or even backing the UUCSS House Band. Past choir and/or other musical experience is helpful but not required. Sight singing and ear training classes can be arranged with the music director to provide individual attention and assistance with the music.